New year, all new everything! It's one of my favorite OLD (retired) Amuse wood block stamps. The background sparkles were accidental, but works! Check out what I brain stormed with the buildings! 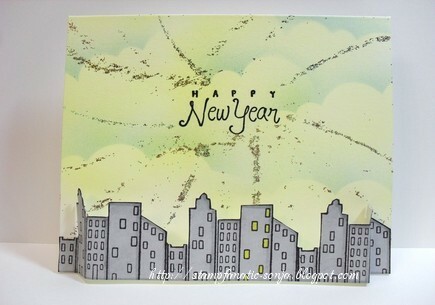 It is 1 stamp that I stamped 3x and connected together while doing so...but look what I did...folded the the ends where the buildings meet and made it 3 dimensional! Isn't that super fun?!! Just adds a little some thing to a OK. card! Thanks for stopping by today! May your 2013 be prosperous!